Awwww, goody! 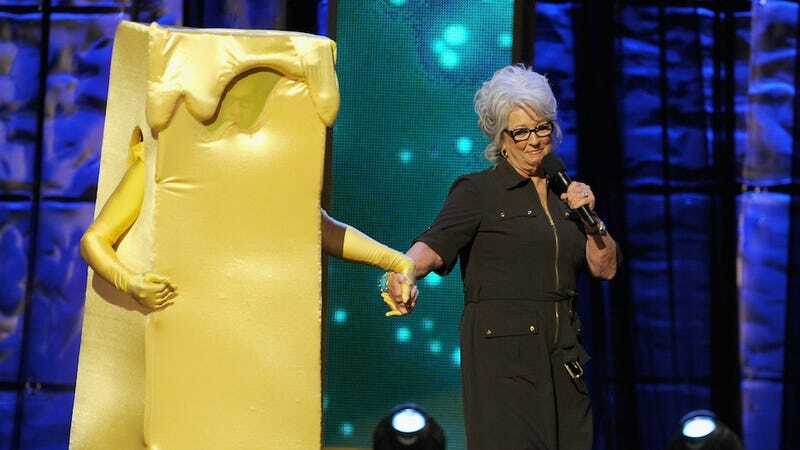 America's happy-go-lucky racist grandmother Paula Deen has just announced that she will be leaving a buttery snail trail across the country as she kicks off a nationwide tour this summer. The first seven shows of the Paula Deen Live! tour will take place in southern cities like Pigeon Forge, Nashville and Atlanta. Stops outside of the region have yet to be announced. That's the excitement of it all," Deen told the Miami New Times. "My fans get to be part of the show." "My husband, Michael, will be with me, and the crowd just loves him. He's an integral part of the show. And he will put me in my place in a New York minute! We have so much fun bantering back and forth with each other." Tickets go on sale May 1st so get 'em while they're hot out of the deep frier. Or, you know, choose not to throw your money at someone who romanticizes slavery and get your food-fill elsewhere. Up to you!